‘Tis the season for deep coughs, sniffles and shivers…not to mention, cozy afternoons with hot chocolate, holiday cheer, and scrumptious soup. When the weather is brisk, there’s no better time to invest an afternoon seasoning, chopping and measuring in the kitchen, the outcome is an evening of warmth sipping a light and enjoyable creation. As a huge fan of quinoa, I wanted to try a soup that incorporated that little crunch I crave, paired with some ingredients and techniques I had never experimented with (kale…poaching chicken…can you say newbie?) While I may have called my mom to ask how I should attempt draining quinoa without a siv (paper towel…), I must say this is one easy soup if a rookie like me can pull it off. I hope you can find the time to try it too! Not necessarily a “use what you’ve already got” recipe. But definitely worth the trip to the grocery store! 2. Heat oil in a large soup pot over medium heat, add celery, carrot and onion, season with salt pepper. Saute about 10 minutes. 4. Add kale and garlic to bowl, season with more salt and pepper, saute for 2 minutes. 6. Add raw chicken breasts, cut in half, to the pot and cook for 10 minutes, or until fully cooked. 7. Chop sweet potato and potato. Rinse quinoa. 8. 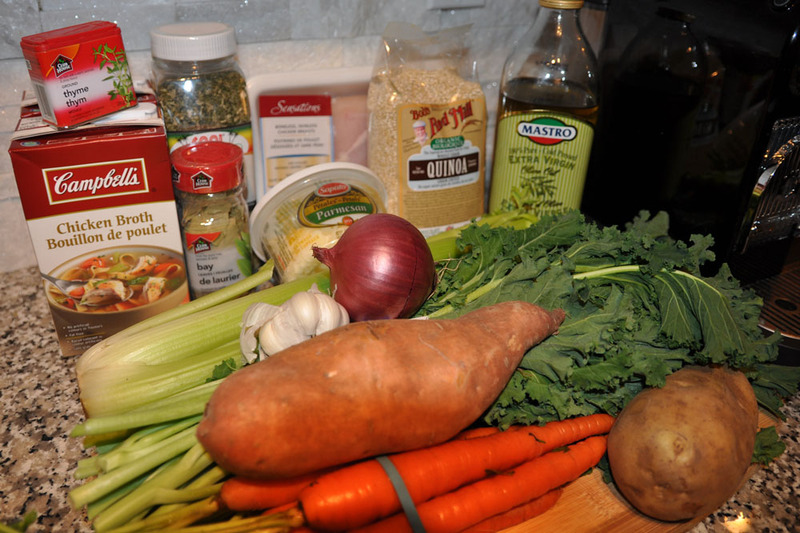 Remove cooked chicken, add sweet potato, potato and quinoa to boiling broth. 9. Place lid, lower to medium heat, cook for 10 minutes or until potatoes are tender. Meanwhile, shred chicken. 10. Add chicken to the soup, remove bay leaf and add Parmesan cheese, stir. 11. Salt and pepper to taste. Serve topped with Parmesan cheese, if desired. See this recipe in its original form here. I got to eat the demo!